This oval shape pin is reminiscent of an antique broach. Set in the gold rim are dark mauve letters with the words, "Remember Me" on the top and "Loving You" at the bottom. 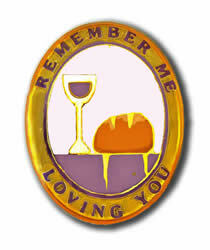 The symbols of Jesus-- bread, wine, and the altar-- are expressed as a glass of wine, a loaf of bread, and a table.